Thanks to student teacher Justine Wilmot from Queens U for this story! 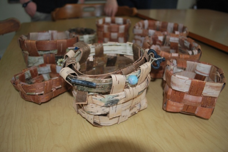 In just three hours, spread between two art periods, Pine River students completed individual birch bark baskets led by student teacher Justine Wilmot. Justine, with the help of PRI Executive Director John Fallis, harvested the bark from trees found on site. 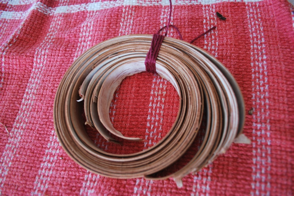 Nine unbroken sheets, 40cm by 60cm each, were collected overall. 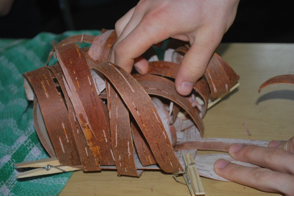 Starting off, students were instructed to cut even strips lengthwise on their sheets to create the base of their basket. This task was difficult for some because their bark was curled tightly or was brittle and weak. 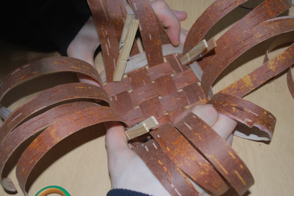 After weaving their base, strips were added to the sides and woven in one at a time. This was a challenging process that required a lot of patience and focus. 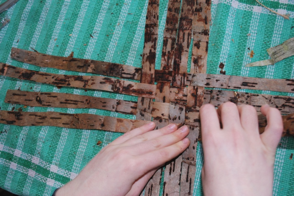 Most of the birch bark was curled and got in the way, making it difficult to hold it together. After the sides were woven the final top rim was added and the baskets were complete. Overall, there was a lot of hard work put into the baskets and students should be extremely proud of their work. The finished baskets are a product of persistence, patience and focus. Each basket is one of a kind and is a reflection of its creator. 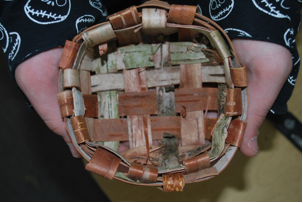 Congratulations PRI students, now it’s time to start your own birch bark basket story.